Gus is a one year old tri-color male basset hound. He, as with all our bassets, is a pure bred basset & has CKC registration papers. Please see Sire & Dam page for parents' information. It has been a hard decision for us to find a home for Gus. He was our pick of the litter from last year's litter & we just fell in love with him, so decided to keep him. Well, now that he is grown, we've come to realize that we just have way too many bassets in our yard and he would be happier with a family that can give him more one on one attention. Gus has a wonderful personality! He loves to play & chase after a ball. 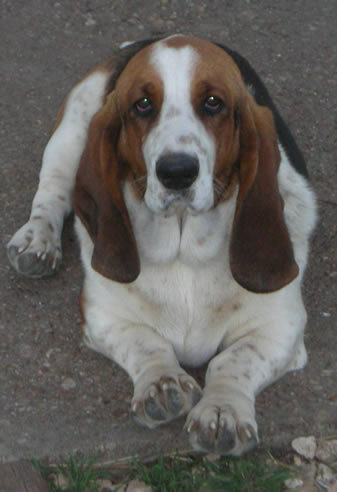 He is very loving and affectionate to the other bassets & recent litter of puppies. He would be great for breeding or even just as an addition to your family. We want to make sure Gus goes to a great home, so please let us know if you are interested or have any questions, we would love to talk with you more about him.